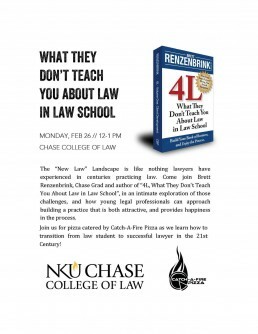 Join us in welcoming Chase alum Brett Renzenbrink ’10 to campus on Mon., Feb. 26. Enjoy pizza catered by Catch-A-Fire Pizza as we discuss the struggles of being a 21st Century lawyer and how to overcome them. The presentation will be held in NH 324 from noon – 1 p.m.